Our 780W Solar Backup System would typically be used where mains power is unstable. Applications include, remote location homes in the UK and abroad, many of our solar backup systems are used on the Africa Continent where power outages are a common occurrence. 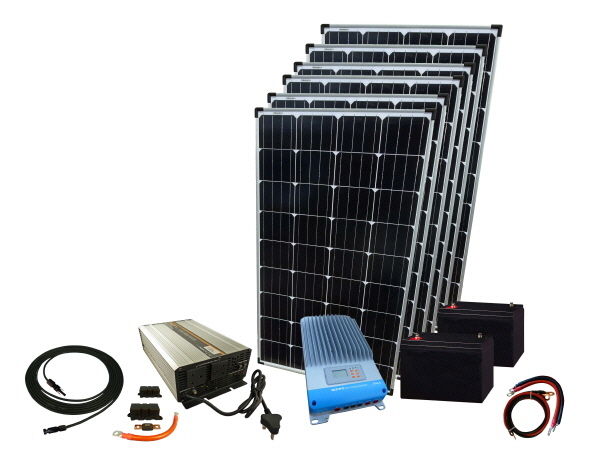 Each kit has been designed for a quick and easy install and include all cables and connectors along with a 2000W Sunshine Power Inverter/Charger to provide an uninterrupted power supply (UPS). When mains power is available, household appliances draw power directly from the mains power (National Grid) and the built in smart battery charger will monitor and maintain the charge in your batteries. If mains power fails, the unit automatically switches over to an external 12 volt battery source to power connected equipment with voltage and frequency-controlled AC power giving you a stable power supply for running your electrical appliances during power outage. Using the power of the sun and a state of art MPPT controller that intelligently regulates the working voltage of the solar panel this system can deliver approximately 260Ah on a 12V system per day during the summer months.